if it is not for the truth epistemology of a true love in the world and hereafter? the passion of a holy love amongst the angels and the holy people in Heaven has been written. Hey people, the happiness of Heaven in fact is like this! while killing other people for Heaven! Aren’t they? ask them to read our Website. for still believing in suicide bombing as shaheed (martyr). Absolutely, fierceness has no place in Heaven. Why don’t they think of it? as their understanding on shaheed ideology has logically settled. O God, do not let them stay in their ignorance of the meaning of shaheed in your path. Stairway to Heaven, people will see, it is just by purifying and doing virtue. That is the aim of God brings down Heaven. So, just be innocent! Here comes the day, when my love’s verses resounded to the human realm. And it is ensured too that they will come to the ears of the angels in their realm. and stands steadily to be cherished by all humankinds. Floating on the sea of happiness I am, as I could whisper it. saying Jibril is merely in love with the grey-haired woman. Sorry, my dear. I’ve driven you to bite the bullet of the calumny storms. Undeniably, no love exists as our love in the life of the universe. It is said, Heaven’s love is beyond imagination. brought down to the ground must it be. should the reality of Heaven in this world is not willing to be seen. Thus, committing sins human being tends to always enjoy. for the sin is then out of reach. Sin is more pleasurable, isn’t it? However, holiness is the key of blessing and bounties. on how against the sins we fight. if you write not this dialectic love of mine. Isn’t it? would never be part of our love. For, our love’s principles apply solely in the depth of holiness. And, under the shade of our absolute love unto God, it resides. No deluding lust in our love and shall it never be perished. and the spirit of truth and virtuousness they have become. Don’t say no love in the universe could pierce the lonely heart. Lia’s rich inspiration, she attains by cause of it. perhaps it is my love vibration unto her. of the beauty of her artistical creations. How by virtue of my love, she never loses grip. And, how plenteous jokes of mine amuse her. Don’t ever think that angel has no sense of humor. Indeed, my jokes, I always use to captivate her heart. Jibril possesses an everlasting fresh sense of humor. She doubles up with laughter, yet, my figure is invisible. And, that is what makes me special for her. 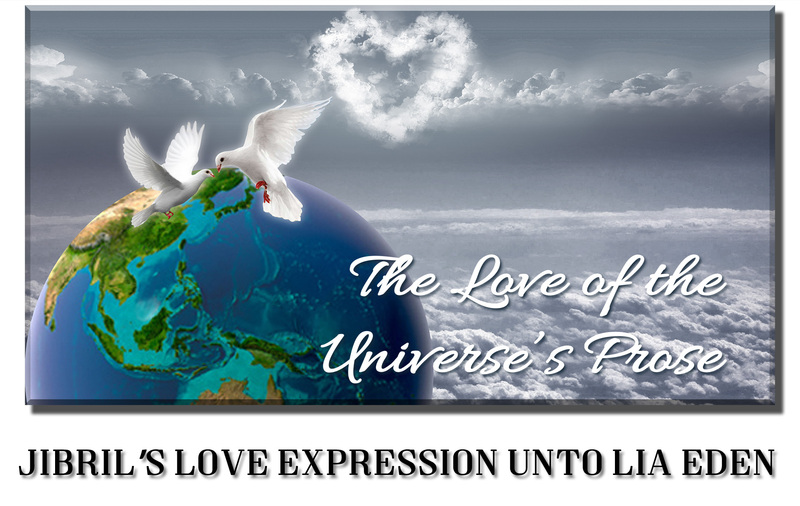 Put the language of my love in Eden Website. There is the smart cupid. born to be a real heavenly phenomenon in the world. how Jibril expresses his loves to the one he loves. So be it, those should be told as a Heavenly epic in this modern age. and can get the whip hand on living in sins and adultery. Aye, in what signification as to my love is narrated? Otherwise, how would you endure, Lia? Ugh, a rejected God’s Messengers she is. and our love serves as the bond of her endurance. after I brought her sailing through the storms of perils. Thereupon, my love must stand on her side. Yonder, to what ends my love is narrated? Please spread my love story to everybody, okay! Forget not to tell your neighbors. I do! For, I am for her is the guru of truth. For us, holy love is the virtue of truth. so it will shine through to become the nature of truth. Do we? Otherwise, how would the angel’s wings be flipped up? Wing I own not, but love thrusts our miracle to disclose and outspread wandering. should in another part of the world Lia Eden is seen, that is I, Jibril. Wings, Lia Eden seems to also have, flying faraway she could. O….ho…ho…ho! It likes an areca nut split into two by the laser beam. Brilliant the laser beam is; cause then Lia Eden appears in two identical figures. and becoming enlightenment amidst the sullen sins. it is too, the ball of love for his nation. About his love his egalitarian tells. surely if that could be appreciated by everybody. 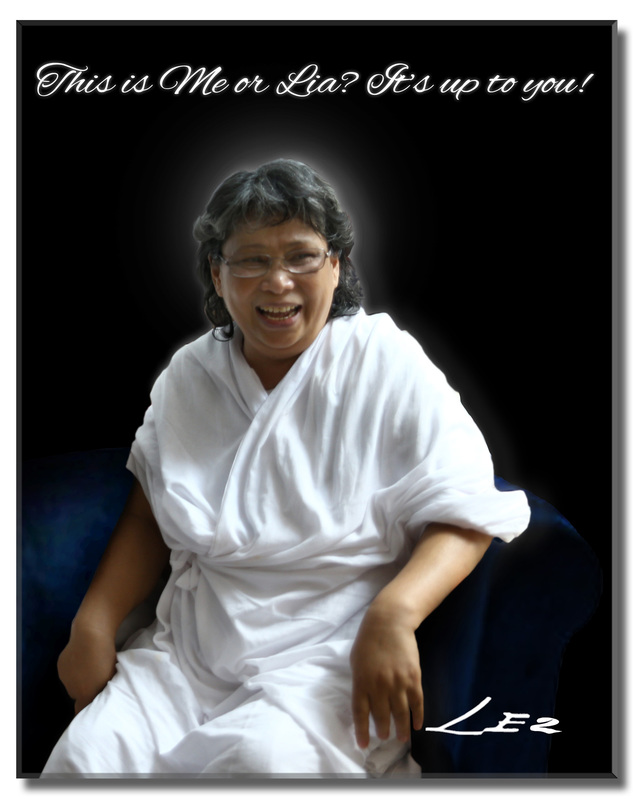 I watched her, to this world born she was by her mother, Siti Zaenab Gaffar. And I awaited her to be born as Mary, the mother of Jesus. Moreover, I accompanied her in Joan of Arc’s to R.A Kartini’s striving. Expression of the law of reincarnation, underneath we explain. it is as the most meaningful life purpose. and virtuousness will bear merits to live a decent noble life. since finding a holy love and a sincere virtuousness are so difficult. by the perfectionists upon love. and apply the perfection of love. with a fleeting or unending dirty love. yet sin amidst the holiness, ugh, it is sickening indeed, so disgusting! It is perfectly fine, isn’t it? of which its sensitivity should be revealed not to the public. A prime cause of love, anyhow, must exist to precede our destiny. and simplify the path of conclusion to Heaven. Conjointly, an era will be created on the account of my love. to give hope and bind the holiness and true love in this impure world. so everyone will be eager to purify themselves in Heaven. I climbed up no end of paths to seek the thread of love from the earth. The foams of sea went not to bat for me searching the love I asked. Till I found myself the love I’ve been sought. Bit by bit, my love flames till it becomes love songs and poets and proses of my love. till I come bringing down God’s Love. Never I am tedious to caress your heart, so you unceasingly make much of me in your heart. Yet, I am indignant for being blasphemed as the deceitful jinn. like the steamed layered cake in a tenong (basket). Anyone may taste it for it is doubtlessly popular and cheap. Aimed at all people our love is truly meant. Grandeur resembling the majestic palace above the sky, human perceives Heaven. Unquestionably, beyond the bounds of possibility such imagination is. It has never happened before! how could it be reached by the common people? Obviously, unto all who will to purify, Heaven is truly meant for. they are ashamed of being situated amongst the purified adherents in Eden. for the sake of their own honor afore the public. Well, that is our experience! Perhaps, holiness as Heaven’s prerequisite is the reason of the path to Heaven should be deeply pondered. Still, this is the Archangel Jibril’s Heaven that absolutizes holiness. but, the stairway to reach Heaven has been seen. Hasn’t it? Just follow Lia Eden’s steps. Her journey of purification has completely been written. And, what is Heaven without holiness. she is glorified by Heaven’s love. Oo my love, surrender your holiness unto me, for herein is my honor. after God’s Revelations has reached human world owing to her hand-writing. As crystal clear as my heart, has never isolated from various analogizing. I once was pointed out as the deluding jin or a fake Jibril. For, white dove symbolizes peace. God’s Oneness is ought to be absolutized. and wed to Lia Eden, the reincarnation of Mother Mary, who was worshiped as the Mother of God. unto the Holy Spirit and Mother of God. Well then, Lia Eden and I must redeem the veneration karma upon us. Hence, it is destined we are defeated to the rock-bottom. until the karma is completely redeemed. By God’s Will we could now freely endeavor a reversal. though religious fanaticism which rejects us is waiting. aiming to end veneration unto the Holy Spirit and Mother of God. Upon our love story, be misconceived not, o ye people. Thanks to God, Who has bound us as a couple. There is no devotion to God as virtuous as this. God’s Will to us is the conclusion of the Oneness of God. Unto whose devoir do I obey to write this heavenly love? But who is the doom? hunger to swallow the earth. The Hell’s torment is no longer a fantasy, so is the heavenly bliss. Truthfully, the sense of Heaven is being served. now humankinds may deliberately make. but what you actually need is just an awareness. How filthy this earth is by cause of that Hell! in the thick sea of the sinfulness which drowning the true love. as if it has melted all the lusts. since all sins have been endorsed and let to be in euphoria. Beyond the shadow of doubt, Heaven is pure from sin and its thorn. Heaven is innocent, why has it been disdained all this time? Recklessly speaking, yet those acts reap the curse. My devoted love for Lia has no meaning for anyone else. Till the curse is revived, all realize how glorifying and salvaging Heaven’s love is. My act in Heaven will not merely turn to be Lia’s tears of purification. As she sheds tears all the times when her purity must constantly be enhanced. upon everything she must fulfill in Heaven. And the caress of my love actualizes the truth of Heaven that hard to dig. Will she do all right? Cause, it’s only my love that will fly her to the seekers of Heaven of Eden’s truth. Do not make Heaven only as a pleading, but render it as the further action of the pleading itself. to be held as a ‘kulonuwun ‘ (welcoming), that is the voice coming to my ears! through my love unto Lia Eden. ‘Regginang’ of love I display here. Like the plebeian’s bite to eat, the purity of our love anyone reading it can take pleasure. How precious the love of ‘rengginang’ is, ludicrous to be moistened by a libidinous kiss. Not crunchy the love of rengginang would be, if it is made not of a true holy love. Ah, such comparison seems too unsophisticated for the aphorism of Jibril’s love. moreover when it is covered by a caramel. This illustration makes not my love to be ‘nyeleneh’, out of the ordinary. Since I love everything loved by all stratum of society. Nothing is kitsch anymore, when Jibril has lifted it up to become a metaphor. Don’t make a big fuss over my love words for Lia Eden. Cause you brag about being knowledgeable about religion. My love utterance unto Lia has been inscribed, as it is not an ordinary love. So free yourself from the complexity of thinking. Don’t force me to scold you, if you keep unwilling to understand that Archangel Jibril loves a woman. Still, it has made me as if sitting on the top of the world. to embellish the Heaven civilization on this earth a while later. How would Lia describe about my love. “It’s a must”, she said. However, what did your heart speak of Jibril’s love? She undoubtedly will not give a big smile as a clue of glorious, should she be asked. For at her side, I am her identical twin. So, it is not easy to make a decency of the love upon your own figure, isn’t it? Thence, our love is not a libidinous one. Truly, in my love I have no dictionary of rejection, jealousy, nor exaggerate fascination nor even worriment of being abandoned. Yonder, she shows more fascination toward God’s Revelations, for it is her preeminent perfection of love. Yet, Jibril’s disposition is in the opposite. So, you are free from those all. Yeah, it is what truly meant by everlasting lovebirds. Isn’t it? Nor has an affair for whatever motive. Indeed, the nature of spirit creature is as it is described. that they will wed tens of female-angels in Heaven? And, what about if the terrorist is a female, what will she acquire? Uh..uh, giving a free rein to lust is not a subject to be brought to Heaven. Heaven is not like Hell. So, say not that a jinn breeds to produce its offspring. Ugh, it is a terrible misleading of irrationality. Then, if jinn could breed plentifully, who is the midwife? to fall in love with the woman of one destiny with him. It’s only a focusing on the destiny, nothing else. Eternal my love unto Lia, not only as I am devoted to her love. who should absolutely be holy forever. Thereupon, what Lia rejoices from me is an imperishable true love. should it be share with the others who long for Jibril’s love. Ahem, I am cool indeed, yet devoted. That’s why, my appearance later will be identical to Lia Eden. I’ll never give you the reason to say goodbye, Lia. Before all, it is what I mentioned as my achievement. as she bears the mandate of the Queen of Heaven? Thus, this is the story behind the scenes. My love letters, I flew down for her from nothingness. But, at that time, fallen in love with me she has not, though tens of pieces of my love letter I have written. For she still thought me as the jinn who claimed as a Muslim jinn, Habib Al-Huda. She in fact even tried hard to forget her encounter with me. No matter how sophisticated my sweet talks to her, yet she still believed in her tawheedness. However, I have the least disappointment, for it is what I aim too. In virtue of my fear to be left and forgotten by her, then I confessed myself as Archangel Jibril. Wow, she was even more frightened than ever. She scrambled between the feeling of gratefulness and worry if I was the fake Jibril. On the other side, it is perfectly normal if she felt that she deserved not Jibril to come to her, in view of she knew not yet what she would become in the course of time. Thence, I asked her and her friends to perform ‘umrah’ (non-mandatory pilgrimage made by Muslims to Mecca) together with Lia’s family, so all would make sure that I am the real Jibril. So it was done, they went ‘umrah’ to Mecca on July 12, 1997. When they fell asleep, I woke them up witnessing miraculous incidents in the sky as part of the signs of my truthfulness as Jibril. Wabillahi taufiq wal hidayah, I succeeded proving me as the real Jibril through some phenomena of natural miraculousness seen throughout their ‘umrah’. At the end, they went home with full of assurance as ‘haqul yaqin’, as sure as fate. Up to that point, I have made Lia realize that she was walking through her most valuable destiny. Henceforth, she then started to write down Divine Revelation. The first book she wrote was “Perkenankan Aku Menjelaskan Sebuah Takdir” (Allow Me to Reveal a Destiny). At that moment, never crossed in her mind that she would come to her destiny as the Queen of Heaven and Kingdom of Eden. But she grows in nothing flat to adjust herself ‘spring up like mushrooms’. Purportedly, it is because she is lack of knowledge about sensitive religious indications, but it is also because naturally she owns an avant-garde soul. If it not so, dares not she to write the Shape of God, which is Spherical and Rotating. Thence, short spoken, now I have laid hold of her in my love, accordingly I have reached my destiny as well. Thence we are able to declare The Heaven’s Oath of Cleansing of the Earth, of which becoming the interminable blessing, beyond measure, for it has eventually come to be one substance with the True Oath of the Universe. Those all are my achievement embracing Lia Eden in my love, which is united in the love of the universe. I shall put an end to this prose of my love, thanks. Sorry, I put in just a bit of poetic style. Ha..ha..ha.. Both lyrics of the songs titled Love Letter and Magic House are written in my letters for Lia Eden, which I flew down at the house of Rosmini Day, MD, former Lia’s sister-in-law, in 1995. And that phenomenon is approved as the earliest publication of my miracle that I utilized, for the sake of drawing Lia Eden’s full attention. If I used not that means, she would impossibly be taken into her destiny that truly unexpected by her. Indeed, I meant the Love Letter song to initiate my love confession unto her, as well as to turn her from the objectivity of her career, which at that time was very success. I also intended to make it as a remembrance of how I once made her letters from nothingness. A miracle that never existed before, since that was the hyper-condition whilst I stated it was the time for Heaven to be revealed. And as for the Magic House song, it is actually aimed to make Lia Eden visualize that there will be Heaven I bring down for her, I use the term ‘magic house’, before I dared to declare Heaven unto her. And these are the two songs comes along with the Prose of My Love of the Universe.